Winter might conjure pleasant memories of playing in the snow, but it is hardly a season most of us would consider symbolic of childhood. We more naturally associate the “winter of life” with a time when it is only our hair, if we even have any, that is snowy. Yet, the earliest stage of life is precisely what winter represents, according to the Maharal, in his Gur Aryeh supercommentary on Rashi (Genesis 26:21). spring to reflect the vibrancy and energy of youth. And winter to evoke childhood. On the surface, to eyes unaided by deeper recognition, it might indeed seem strange; winter, after all, is a stark time, a season barren of activity and growth. But the superficial image betrays the reality. When spring finally arrives each year, after all, the new leaves haven’t appeared ex nihilo. 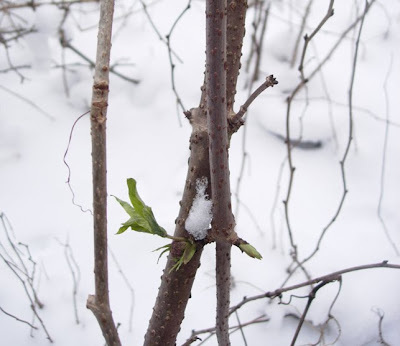 The buds from which they emerge have been developing for months, the sap in the seemingly dormant trees was rising even as the thermometer’s mercury was falling. The evidence of life that at last presents itself with the approach of Pesach has been actively preparing its case since Chanukah. See for yourself. Go outside and inspect the leafless trees’ branches. The buds may be biding their time, but they are clearly there, ready to explode with green when commanded. In fact, we humans are actually compared to trees, (Deuteronomy 20:19). Even though the verse’s context (forbidding gratuitously felling trees during war), at least according to Rashi, implies a quizzical question mark at its end (“Is a man a tree of the field?”), other Rishonim, like the Ibn Ezra, read the verse as making a straight comparison. And the sifrei nistar similarly see significance in the plain meaning of the words. And so the approaching winter celebration of Tu B’Shvat, the day the Gemara calls the “Rosh Hashana for trees,” should make us think about the potential that can lie in apparent chaos. It’s a timely thought for other reasons too. A month after Tu B’Shvat comes Purim, when we celebrate the turning of a seemingly hopeless and tragic situation into a joyous one. Esther was the bud, and when the right time came, she blossomed. And this time of Jewish year is when we read in shul about Yetzias Mitzrayim (the Exodus from Egypt), how, in the oppressive prison that was ancient Egypt, a redeemer came of age and, at the command of Hashem, brought people to bloom. So a conspiracy of factors pushes us to ponder the power of potential — in Jewish history (Esther and Yetzias Mitzrayim); in the seasons of the year (those winter buds and sap); and in life (all the illustrious people who were once childish ones). The thought might reassure and animate us, even those of us with sa’aros levonos, or white hair. For what emerges from the Maharal and Jewish history and the seasons is the lesson that what matters more than how many years may have managed to get behind us is the potential we still carry within us.